Finding Your Energy Through NLP! How’s what you’ve always done worked out for you? Is what you’ve been doing to improve yourself, your family, you’re relationships and your income making a difference at all? If so, do more of that. If not, listen to what Art Giser and I have to share with you today. You stand to find much more than just energy through NLP. 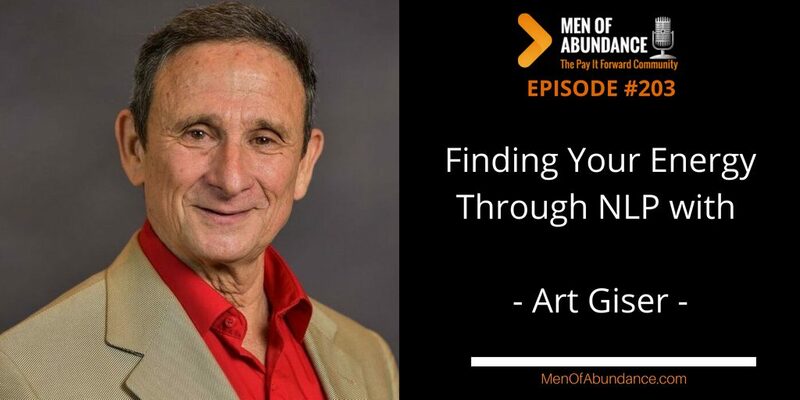 Art Giser, the creator of Energetic NLP, is an internationally renowned NLP trainer, life coach, corporate consultant, teacher, psychic, and healer. Art’s gift is to help people develop their hidden abilities and discover how amazing they truly are, so that they are more successful, have more fun, better health, more satisfying relationships, grow spiritually, and contribute more to the world. Art’s unique background: he is an NLP trainer, medical researcher; consultant to major corporations in leadership; 37 years of study and development in the fields of NLP, spirituality, life coaching, healing, and intuition development. He studied with a diverse group of amazing healers, intuitives, and spiritual leaders, and with all of the developers of NLP. He has had two empowerments from the Dali Lama of Tibet. The internationally known healer, John of God of Brazil, has been energetically working with Art since 2002 to enhance his healing and intuitive abilities. Art is known for the joy, humor and compassion that he brings to his work; his ability to simplify complex ideas; and his magical ability to help people release old programming, emotions and limiting beliefs and tap into their Miraculous Self. I work with small and medium-sized businesses that have little to no money to spend on marketing. I show you how to generate all the leads you can possibly handle by evaluating your existing marketing and showing you how to dramatically reduce or eliminate the money you’re currently spending while significantly increasing both your response and conversion rates. I can typically double or triple your current response rate…but a 50 to 100 times increase isn’t out of the question. And best of all, the strategies I’ll teach you will continue to work for you month after month for as long as you’re in business. But listen, I know talk is cheap… and I know that you’ve heard these types of claims before, so put me to the test and let me prove that everything I’ve just said is 100% true. If you will invest just 45 minutes with me, I promise that I will find you at least $10,000 in additional revenue that you can begin to put in your pocket this month… and every month moving forward. We can do this 45 minute session over the phone as an added convenience to you… and I promise during the time we’re together that I won’t try to sell you a thing. But there is one catch. I’m writing a book detailing the strategies I use to find $10,000 for any small business owner, and my publisher has asked me to include a few additional case studies in my book. I would ask those of you who take me up on my offer to allow me to document your results and use them in my book, either under your real name or anonymously.